Focaccia bread about to go in the oven. I asked Keri last night to teach me how to make Focaccia bread today. This is the result of my first attempt. Lately, she had been baking this bread a lot since it’s very easy to do and tastes delicious. The bread is half devoured already with a bowl of homemade potato leek soup. After making and kneading the dough, I mixed up a quarter cup of olive oil, fresh thyme, herbs de provence, and Italian seasoning. 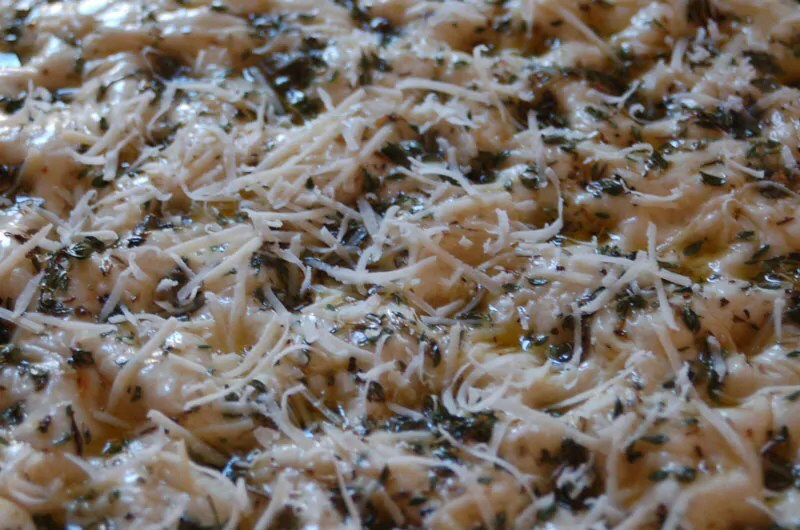 I brushed this atop the dough and sprinkled freshly grated parmesan cheese over that before putting it in the oven. Click on the pictures to see them full size. First get a large bowl and combine the water,sugar, and yeast. Mix well and let the yeast rise for about ten minutes. Next you’ll want to add flour about 1/2 cup at a time until all the liquid is absorbed. 1 1/2 cups is approximate. Start kneading the dough and as you knead add salt. Once the dough feels like it’s all mixed well you’ll need to shape it into a ball and then on a flour dusted countertop flatten the dough into a pizza shape and transfer to an oiled baking sheet. At this point use your fingertips and poke “wells” into the top of dough. Place this in the oven and make sure the oven is OFF. Let the dough rise for 10 minutes. Repeat the “wells”. Let rise again for another 10 minutes and repeat the “wells”. This time let it rise on countertop and turn on your oven to 350 degrees. 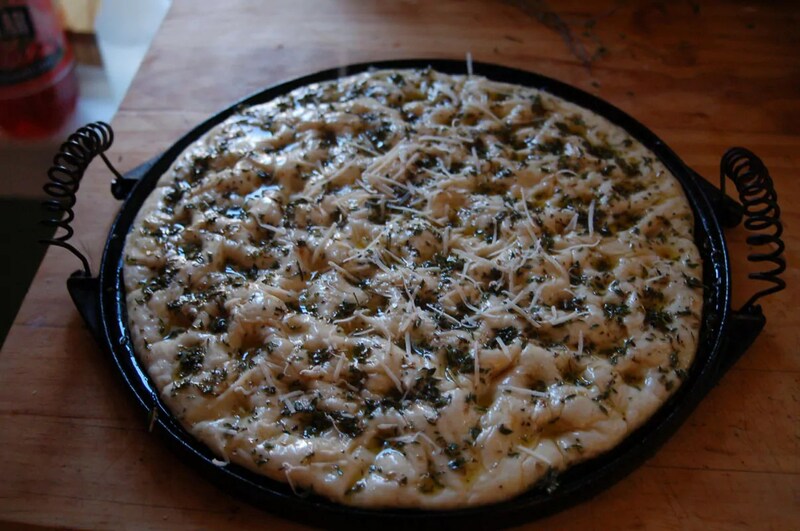 While the oven is warming up you can now baste on your herb/oil topping and sprinkle the cheese on top. Bake it! It won’t take much longer than 15 minutes or so. Bake until top is golden. @Melissa I'll add the recipe to the post. @Jennifer That's one of our newest cast iron skillets. Found it for only 12 bucks! So, how did it turn out? 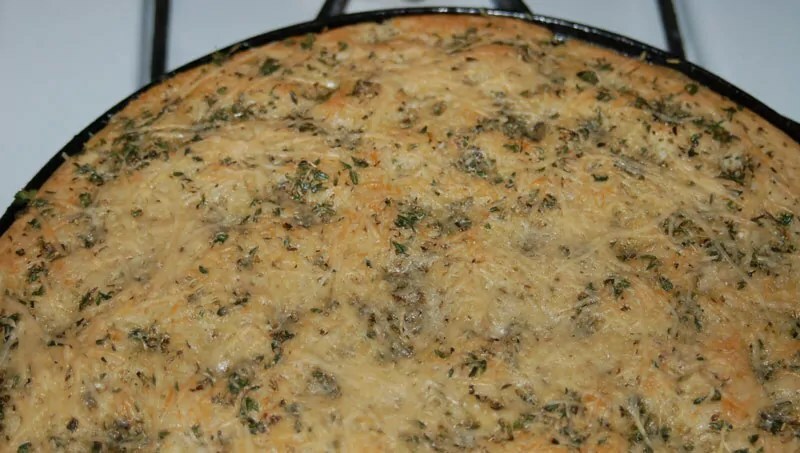 I love focaccia bread…a little too much. Thanks for the recipe! OOOOh, focassia up close! Went to print it, and ended up printing your day's entries, including my previous post. Guess I need to learn how to cancel the printer. The good thing is that I now saw that your brother, Jesse has written a book! Hadn't been on fb enough lately to notice. I'll check it out. haha cool. if you go to http://www.thegoblinroad.com and click the top right page peel link you can get the first two chapters of that book for free. Great, thank's! I'll check it out. Good night.